When legendary horror director George A Romero unleashed Night of the Living Dead on an unsuspecting public in 1968, he revolutionised horror cinema. Shot in the familiar black and white of Universal's monster movies and the 1950s Cold War alien invasion flicks, it proceeded to dissect American mores with a clinical precision that was years ahead of its time. The brutal collapse of the nuclear family as a sweet little girl cannibalises her parents was to become a key theme of the horror films of the 1970s, when demon children and grotesque dysfunctional families would terrorise our screens in cult classics such as The Omen, The Exorcist, Rosemary's Baby, The Shining and The Texas Chainsaw Massacre, whilst the film's suggestion that the rise of the undead hordes could have something to do with governmental radiation experiments gone wrong was over 20 years ahead of the conspiracy theories of The X-Files. 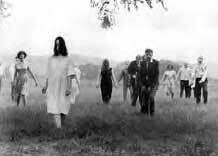 Night of the Living Dead set the standard for a new wave of horror films: from then on, nobody was safe. The all-American couple we assume at first to be the hero and heroine are picked off within minutes and at the end of the film, the hero, a black man, survives a siege of zombies only to be shot dead by the police, who seem as driven in their zeal to hunt down and destroy the undead as the latter are to kill and eat the human beings, creating uneasy parallels between the so-called 'good guys' of the rescue posse and KKK-style lynch mobs. The original version of Dawn of the Dead (1978) was filmed as a kind of sequel. Well, it's about zombies anyway. Shot in garish Technicolor, it depicts the undead shambling mindlessly round a suburban shopping mall, as if consumerism, rather than the hunt for brains, is their motivating force. As a satire on the reductive powers of modern consumer culture it's brilliant. As a film, however, it's bloody boring. It's the kind of film you can fall asleep in quite safely, because you can wake up half an hour later and nothing will have changed. Judging by the trailers, however, the remake of Dawn of the Dead promises a little more action. But would this be at the expense of the message? Well, it looked as if I was going to have fun finding out. Right from the start, the new film takes no prisoners. In the nine minute sequence that precedes the credits, we are introduced to our heroine, Ana (Sarah Polley), a hospital nurse (at least we assume she's our heroine). She finishes her shift, and we watch her drive home, happily oblivious to the hints that something very wrong is afoot (a patient at the hospital with a mysterious condition; emergency news flashes on the radio and telly). We see her stop outside her house to speak to a cute little girl: 'Oh, you're so dead!' we all cry together. Five minutes into the movie, life as Ana knows it is officially over. She and her husband wake in the night to find the cute little girl in their bedroom. Except she ain't so cute any more. Especially not when she takes a bloody great chunk out of the husband's neck. A minute later, the husband's dead, and Ana can get no answer from the emergency services. Next minute, the husband's up again. You get the picture. Cue a fantastically frenetic credit sequence, as blood red titles are interspersed with flashes of an America in chaos. Cars colliding, houses burning, streets running with blood. Oh, and zombies. Zombies everywhere. Ana and a handful of other survivors escape to the relative safety of a deserted (you guessed it) shopping mall, which seems to be zombie free. for the moment. And so the siege begins. In the original version of Dawn of the Dead, the zombies have already invaded the mall and are drifting aimlessly around it, as if compelled by some dim memory of their former lives. The remake, however, revolves around the survivors' attempts to keep the monsters out. So, yes, Romero's theme of zombies = mindless consumers conditioned by the media to confirm to controlled patterns of behaviour doesn't really hold up. Instead, the film harks back to one of the central themes of Night of the Living Dead: man's inhumanity to man. Not for our little band of survivors the spirit of the Blitz, with everyone working together against all odds. In Dawn of the Dead, when the going gets tough, the tough get tooled up, panic and start shooting each other. As many people are killed by the selfish fear of their fellow human beings as are slaughtered by the undead cannibals. In our fractured, egocentric society, there is no sense of community. When it comes to a question of our own survival, it seems that we're all monsters. Everyone, that is, but the saintly Ana, who's a nurse, don't forget, so therefore, in the two-dimensional world of horror movie characters, a Good Person. Did I say two-dimensional? Hmm, that's probably an insult to well-rounded cartoon characters like Taz and Daphne from Scooby-Doo. Ana is the angel of mercy. Kenneth (Ving 'Marcellus Wallace' Rhames) is the tough cop who knows how to handle a situation. Andre (Mekhi Phifer) is the boy from the hood trying to do right by his pregnant girlfriend. Michael (Jack Weber) is the no-hope loser who finally manages to do the right thing. CJ (Michael Kelly) is the redneck security guard who becomes a hero and the others are, er, zombie fodder. And yet this cowardly bunch do eventually learn to work together, putting aside selfish concerns and acting for the good of the group, even if that means sacrificing their own lives. Yada yada yada. Face it, whilst Dawn of the Dead '78 was all about the message, Dawn of the Dead 2004 says f*ck the message, let's shed some blood. The film is a manic rollercoaster of exciting action and real edge-of-seat suspense, with buckets of gore and some truly terrifying moments (zombie baby, anyone?) and some genuinely unexpected twists (watch out for the chainsaw bit, it's genius). But perhaps the nicest thing about Dead by Dawn (if nice is a word that can be applied to this gruesome piece of work) is that it isn't even taking the piss. This is no post-modern take on the zombie genre, and although the cast of the original film do appear (as zombies, apparently) there are no knowing inside jokes cracked. In fact the one thing that really strains credibility (aside from the unexpected epidemic of living dead walking the earth - oh, and the fact that nobody has a mobile) is the fact that none of the survivors have heard of zombies before. Have these people never been to the cinema?! Fortunately it doesn't take them long to fathom the rules (bites carry the zombie bug; shoot 'em in the head and they won't get back up - it's not that tricky really) so the so-called survivors (just wait...) can get down to the business of killing as many undead as possible as they make a bid for freedom. And just when you think it's all over. it's not. Stay for the final credits or you're missing out. Dawn of the Dead is an old-fashioned horror movie filmed in a slick modern style that owes as much to the likes of Quentin Tarantino as it does to George A Romero. The script could have been written in the '70s (well, it pretty much was) but the style is pure MTV, adopting documentary style camera work not unlike that of 21 grams and amassing dizzyingly effective montages of fragmented images that reflect perfectly the theme of a nation and community in utter disarray. Manic, exciting, funny and, yes, actually scary as well, Dawn of the Dead is one hell of a film. If this is the (ugly, rotting) face of 21st century horror then all I can say is, bring it on.